The fun of shopping and joy of discovery that comes with it must never die. Beyond being a necessary evil to meet our needs, retail responds to our “wants,” and our aspirations are fueled and realized in large part through retail. The promise of the retail store, or a food services establishment or bank branch is that our time and buying power will be respected. When he declared, “the medium is the message,” media guru Marshall McLuhan was in part commenting that the use of a medium inherently declares “We care what you think about us and that you come to know us better”. The store “promise” is also that staff will be able to answer our questions in the fair exchange during a purchase transaction. When information is not provided “caveat emptor” (let the buyer beware) is assumed to apply. Is it any wonder that online commerce is realizing such growth. Browsing, discovery, navigation, information and ordering can all be accomplished by moving just a few muscles, while comfortably parked in a favorite easy chair at home, or in just a little extra time at the office. What happens to the brand equity through the investment by brands? To the tactile experience of product consideration and to the outing and experience of shopping with friends, family and colleagues… and to the bricks and mortar, shelf stocking and staff of physical retail? Media outlets such as the Wall Street Journal and retail analysts such as Virtual Logistics are reporting on the financial struggles of retail. While retail has lived by the 3P’s mantra including product, price and promotion, this drum-beat has been marching consumers toward online shopping and away from retail experiences. So a more empowering 3P’s mantra has emerged that is focusing retail on the productivity of place, processes and people. This is where dynamic place-based delivers high value. Digital media breathes new life into a physical retail. It allows brands to tell their story and sell their story. It can illustrate the lifestyle and context of products being offered and provide information that enables selection by the consumer and it motivates purchase, up-sell and cross-selling. Dynamic signage reinforces key product messages that staff can use to achieve better results, and in-store promotional campaigns can be executed to reflect changes in inventory and buying propensity. Successful retailers deeply understand the critical importance of aligning their brand with the identity and aspirations of their customers. In serving this need, nothing is more compelling than illustrating how consumer desires will be fulfilled. The video wall in Hollister stores with its webcam view of Huntington Beach, CA aptly reinforces the surfer culture, just as fashion show runway footage does so in clothing retail, and outdoor action footage does in sporting goods stores. “Visual is our new language” advertising pundit Paco Underhill of Envirosell declared during his address at Digital Signage Expo several years ago. His insight was intended as commentary on digital signage, but has become, as with Marshall McLuhan, the urgent call to reinvigorate the retail experience. Management and Marketing guru Peter Drucker has said, “Marketing is the whole business seen from the point of view of its final result, that is, from the customer’s point of view”. Let’s return that “Oh Yea!” spirit to retail with vitality, context and information that can be so easily provided by dynamic digital signage. What’s on the menus at your fast food business? If you’re using digital signage, the possibilities are limitless, and the results can be quicker-moving lines, higher sales, greater customer satisfaction and an elevated brand image. With digital signage, content is king. One sure way to waste your investment is to show the same content day after day. To get the most from digital signage, you should strive to be continually fresh and creative. Think about what will catch your customers’ eyes and enhance their experience. Consider providing value-added infotainment to reduce perceived wait times. Leverage social media reviews. Use attention-grabbing graphics and mouthwatering dynamic imagery to upsell or promote new menu items—selling the “sizzle” is a perfect application for LG Full HD and Ultra HD displays with IPS screen technology for best-in-class viewing. 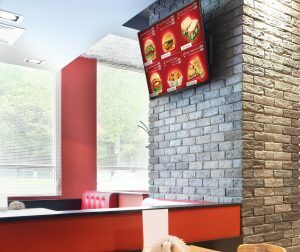 IPS technology will ensure crisp details and vivid, accurate colors so your offerings and brand imagery will look absolutely delicious, even from an angle as customers wait to order. Here’s a tip: You can encourage the sale of specific items at specific times by adding small, nearly imperceptible moving elements to draw attention to a particular product—even a mild intermittent shaking or wiggling of an image will draw attention to itself. Using digital signage as menu boards also enables you to easily comply with local, state and federal regulations by clearly displaying Calorie Sources and Nutritional Information without sacrificing other content. Information can be updated in a snap using day-part scheduling for breakfast, lunch specials and dinner. Digital signage makes manual or automatic pricing updates extremely simple, allowing spur-of-the-moment changes for special offers. Pricing can also be managed from a central location so that all stores or just select locations receive updates simultaneously. Remember to reward your loyal fans. Digital signage can play an exciting role in creating a value-adding mobile-integrated experience for your app-opted customers via Bluetooth Beacons, audio/visual cues, QR codes and instant discount coupons. And finally, know your audience. What are they doing where your displays are located? What content is the most appropriate? Have you thought about broadcasting live events in the dining area and wrapping your messaging around live TV? 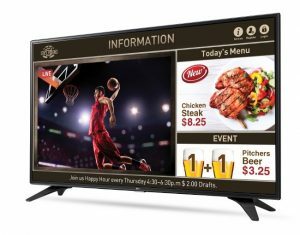 LG digital signage solutions can put all this and more at your fingertips. We have a suite of recommendations for QSR / Food Service here. The cliché, catch all phrase “big data” has confounding marketers who ask, “where do I start” and “what do I do with it”. Everyone in the marketing supply chain should be aware of the value that they bring to this dilemma and opportunity. For digital signage providers and end users, the digital-ness of digital place-based media offers some immediate and high value answers when systems are organized to capture and apply insights. Insights are the result of using data in all its levels of abstraction from data to statistics to information to knowledge to wisdom. 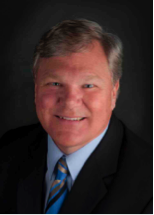 As will be presented in a July webinar hosted by BUNN, each level of data can contribute to the communications goal supporting both capture and exploitation. Data results from transactions. An inherent value of digital signage is that it is always working to be causal in transaction generation in the form of purchase requests and enquiries and in leading the consumer down the path to purchase. The “muscles” of digital signage are flexed further toward intended outcomes when cause and effect are the basis of message presentation. Think of a quick serve restaurant (QSR) drive-thru in which the digital order confirmation board is used to suggest menu options. Order data related to time of day, weather conditions, number in the drive-thru party or a revisiting patron provide data per transaction which when reflecting multiple transaction are statistics and provide information that can be used to predict probable future transactions. In that same drive-thru, the suggestions of different menu items that can augment the patron order offer additional insights, which when applied in future can change the transaction pattern. This allows the QSR to move from message presentation to applying a prescription of suggested items relative to the order, and then to a predictive model of menu suggestion. The result in each case is higher revenue and margin per transaction. “I never guess. It is a capital mistake to theorize before one has data. Insensibly one begins to twist facts to suit theories, instead of theories to suit facts,” notes Sir Arthur Conan Doyle, Author of Sherlock Holmes stories. Dr. Holmes knew about the application of data. Facts have a transformative influence on business. Truth, as reflected and supported by fact, are the basis of modern commerce. This transformation in business began in the “management by objectives (MBO)” movement of the 60’s, and computational power that began on the 70’s led rapidly to Enterprise Resource Planning (ERP) which sought to align resources with priorities. Operational efficiencies in back office functions such as improved inventory awareness, point of sale and supply chain management spawned automated management based on business rules with attention paid to exceptions. Most enterprises now have adequate back office systems. The insights model of data levels of abstraction has transformed business operations. Through this, marketing has shifted slowly from being primarily a creative exercise into the rule-base science of revenue and profit-delivering efficiency. Marketers believe intrinsically that they are creating a new reality for their product, service or enterprise. This creativity is manifested in jingles, tag lines and icons drummed into consumers with huge advertising budgets. It was the age of Mad Men. Every marketer, C-Suite and investor begged duplication of the past branding successes of “a little dab’ll do ya”, Kodak-moments and the Rice Crispie Kids. Madison avenue asks for, and get, the money. As the internet of the 90’s began to transform marketing through increased access to information and the e-commerce and mobile commerce, and social media that have followed, agencies have simply added these arrows to their quiver of billable services. Through this, brands and retailers have focused on gaining return on bricks and mortar investment, most recently adding “owned” media, such as place-based digital signage to “paid” media investment. Now, digital signage has become essential to activating revenues. The traffic that is delivered to the premises by “paid” media is activated by the on-site digital signage that is “owned” by the enterprise. Analytics associated with on-location digital signage use, are the transformative influence on the modern and growing business. That is just a sample from all the positive feedback we received last week. The excitement of our latest and greatest products combined with the Nationals Park D.C. venue drew record attendance for the first LG Commercial Display Roadshow of 2016. With great partners on board, a private stadium tour, batting cage practice, prizes and ballpark food, this all-day event was an amazing experience for all—some of our guests even brought their families and friends and many were wearing Nationals jerseys and hats to show their spirit. Without question, our floor-standing 86-inch Ultra Stretch Display pillar with four-sided screens and the new 55-inch Dual-View Flat OLED Display were the sexiest stars of the show, drawing loads of interest and plenty of wows. And that’s just the way we like it. What’s more, our Clover video walls were configured for touch screen activation with TSItouch, and the IT products showed that desktop equipment can be exhilarating too. We also raffled off a 55-inch consumer OLED television as well as some cool Nationals memorabilia. A special thanks to our technology partners Signagelive, Peerless-AV® professional and TSItouch. Together we hit a grand slam. Stay tuned. We’re coming to San Francisco in July for our next Roadshow. If you’re anywhere near the area, we hope you’ll join us. And of course, we’ll see you at InfoComm in June. BTW, have you seen our OLED webpage yet? Awards commend innovation and best-practices. They recognize intelligent investment and allow everyone to celebrate in advancements. They make us wonder who contributed and who benefited. But what is in the DNA of an award-winning application of digital signage. While the medium serves a rapidly growing number of firms across every sector of the economy for patron, shopper, traveller, staff and student communications, it is most fully embraced by the “needy and the greedy,” those whose survival is most dependent on cost-effective communications, and those at the other end of the scale that have a veracious appetite for greater productivity of place, processes and people. Most nominees in digital media award programs such as DIGI, APEX, Customer Experience, POPAI or Infocomm follow a similar script. A problem or opportunity is addressed by the use of digital media. Since this describes virtually all digital signage initiatives, the real merit-worthy differentiation lies in the “how” of planning, investment and the application of the right tools to achieve results. Award winners live in a digital signage “moneyball” world in which data drives decisions. The magnitude of the problem or opportunity is articulated. Possible outcome scenarios are described as benefits are to be realized. The costs of the sourcing and operating options are quantified. The merit of investment is validated and considered against other priorities. The right people are engaged and actions are taken. (See a previous blog concerning the right digital signage team). The data and information elements of the options are typically described as a comparison of the costs and benefits of different options. This is itself a challenge given the range of options available and the skills that vendors exhibit in presenting their “solution”. The sourcing options are then viewed through various “lenses” that allow the end user to define the approach that best suits their culture, overall priorities and capabilities. The DNA of award-wining signage initiatives clearly demonstrates how the problem was overcome or the opportunity was realized. Digital signage is knowledge-based industry and projects cause an overlap of the priorities and expertise of different departments. The best of the best digital media projects are a demonstration of consensus-building and collaboration under strong leadership. The initiative are exciting to the enterprise and express the will to be different and be better. The solution solves the current need while enabling new approaches to experience, engagement and viewer targeting to be applied. In focusing on “the now,” immediate return on investment is realized, and the future-proofing concern assures that incremental improvements can be sustained, and will not fall prey to debilitating operating costs and “work-around”. Award winners deliver quantifiable benefits that validate and far out-weigh the costs. Every digital signage deployment should be undertaken to distinguish itself in the benefits that it will deliver. Plan that your project can be numbered among those that provide “wow” in terms of quantified benefits, extraordinary presence and efficiency in undertaking. Past award-winners offer the shoulders that every new initiative should stand on and new award-winners define each new level at which the bar is set. Awards offer recognition to a job well done, and they make it easier to gain funding and resources in future. When you undertake a new initiative or take a current one to new levels – go for the gold! There are good reasons for retailers and other consumer environments to provide a mobile app for their customers. But when that app is able to locate and react to Beacon technology, it’s a whole new selling game. It then becomes a smart strategy for engaging customers as they are walking by, or into, the store. That’s why LG has seen a major advantage in building Beacon technology support into our window-facing signage and other displays for retail and QSR. Beacon technology expands a store’s marketing, branding and loyalty options. With it, customers can receive personalized content on their app-equipped smartphones (or tablets), such as a welcome greeting, coupon, product information, call to action, etc. What’s more, beacons also create the ability to interrupt digital signage content running on a display and show customized messaging to a nearby customer. Beacons are small radio transmitters that continually send out Bluetooth Low Energy (BLE) signals in search of app-equipped smartphones within their proximity. For beacons to do their job, however, the customer’s smartphone must have Bluetooth turned on. Once the two connect the beacon triggers a message that pops up on the device’s screen to begin the customer engagement process. How do beacons know the customer? The smartphone’s app can leverage back-end CRM systems and use the customer data to trigger the right message at just the right time. And if you have beacon-supporting digital signage placed throughout the store the technology can track the path the customer takes and trigger cross-selling and upselling messages across different departments. LG digital signage displays for retail and QSR support Beacon and BLE technology. Use them throughout your store to make your customer experience more personal, exciting and rewarding than ever before. Dave Haynes is the founder and editor of the Sixteen:Nine blog. 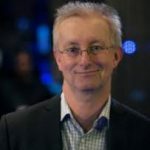 He is a well-known figure in the digital signage and Digital Out Of Home sectors and runs a pair of companies, The Preset Group and pressDOOH. His company, based in the sprawling, heavily-wooded suburbs north of Atlanta, makes large-format outdoor displays for the out of home advertising business and, more recently, emerging markets like fast food drive-thru lanes. LG MRI has about 30,000 units in the field, and based on a plant tour I did last week, there are a lot of new orders getting filled. The company has about 200 employees, and another 100 at a nearby facility that’s focused on military and commercial aircraft displays. It’s that work, putting screens in the cockpits of everything from big passenger jets to fighter aircraft, that pretty much defines what LG MRI now does. 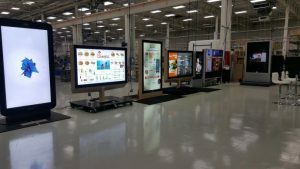 With 100% market share in the North American market, CEO, founder and sole owner Dunn was looking for new markets for specialty displays, and found digital signage. It’s a very different business. 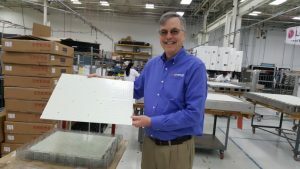 While the aerospace industry is driven by engineers who, by necessity and DNA, are focused on precision and uptime (screens just can’t dim or die), the out of home industry is run by media people who tend to be focused more on the unit price of displays, and their base look and feel – not their underlying specs. It makes Dunn crazy. An engineer to the core, he sees complicated, mission-critical jobs being judged and decided on the wrong factors. LG MRI’s unit prices tend to be significantly higher than the offshore and North American companies it competes against, but Dunn argues the total cost of ownership on outdoor display jobs is almost always wildly higher in going with less engineered product. Where competing displays aren’t meeting advertised specs the moment they’re turned on outside, and will fall below acceptable viewing standards in about three years, Dunn says his company’s displays will last at least 10 years and look as bright and crisp as the day they got powered up. That lifespan happens, he says, because almost half of the people on staff at LG MRI are engineers. Dunn has 90 kindred spirits who are just as fixated as him on uptime, viewing quality, and process. Among the many things Dunn showed me through the better part of a full day at the facility was a demo – dumbed-down for dumb me – on something called computational fluid dynamics. It’s a modeling process, involving very complex, pricey software, that uses data analysis and algorithms to model and resolve designs that, in the case of outdoor displays, examines the generation and movement of heat. By using what’s abbreviated as CFD, Dunn’s engineers can model and figure out how displays designs will handle and exhaust all the heat that gets generated by the LED lights that drive super-bright outdoor displays, but also the additional, at times crushing heat load of the sun. The conventional way to get a screen bright enough to cut through mid-afternoon sun, on a Phoenix sidewalk, in July, is to crank up the backlighting and overpower the sun’s rays, and then power a bank of fans and filters in the enclosure to keep the display within acceptable operating temperature ranges. 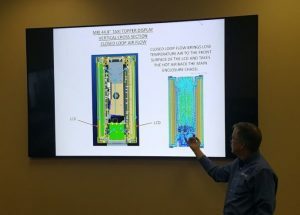 Dunn says that design leads to heat building up and staying trapped inside the core enclosure that houses the critical electronic components, like the display controllers and media players. His team has learned through experience, and validated through computer modeling, progressive generations of designs that move heat through the enclosure and exhaust it, while keeping the electronics isolated and relatively cool in their own sealed air pockets. Between LG MRI and the sister company, American Panel Corporation, there are some 300 patents. Part of the work and knowledge is based on having sorted out ways to optimize display performance. 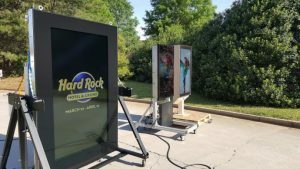 Dunn and his guys set up a demo out back of the Alpharetta plant, in the direct morning sun, to show how an LG MRI display performed against a competing product. Both, Dunn says, look great in a showroom or on a trade show floor. But real world conditions are a different matter. LG MRI’s display is rated at 3,500 lumens, and at 10 am on a bright, warm morning, the external measuring tool read 3,490 nits. The screen beside it, from a major manufacturer, is rated at 2,500, but was actually pushing out 1,540 nits – because of a filter that’s part of the screen design to fight reflection, and because the display was already fighting the sun, heating up and taxing the fans and available power. What was kind of amazing was measuring the brightness from a 45 degree angle, which is how a lot of people are going to see screens when they are walking past an ad display built into a bus shelter or sitting ahead of them in a drive-thru lane. Brightness on the LG MRI screen went down to 2,320 nits. It went down to 381 nits on the brand X display, and the display’s visuals were barely visible. Dunn says that brightness difference, as compelling as it may be, isn’t even the real issue. While the display industry sells on brightness levels, the real measure to care about is contrast. Contrast readings have to clear a certain bar, or viewers aren’t going to be able to distinguish much of what they see on a sunlight-bathed screen. The pix I took didn’t do a great job of showing differences. But my own take was the LG MRI screens were definitely brighter, had a much wider viewing cone and the one in the middle from the pic above, from another manufacturer, had a purple haze to it, brought on by the filter in the glass. I’ve been at other facilities where specialty displays are put together, but can’t fairly comment on whether what LG MRI has and does is wildly different. I can say it was impressive. My unschooled idea of the outdoor specialty display business is buying open-frame high bright displays and building them out back of the offices into environmentally protected, mechanically cooled enclosures. The LG MRI guys, however, pretty much start from scratch. The first thing I saw was a robotics line that builds the integrated circuit boards from the raw, green wafers, and then seals and bakes them. The same line produces the boards for, among many things, F-35 fighters and M1 Abrams tanks. In the main plant, which is about the size of a Costco, LG MRI builds displays up from the raw LCD cell (think a sheet of film) through the LED backlighting layer, circuitry, custom wiring harnesses, metalwork and glass. 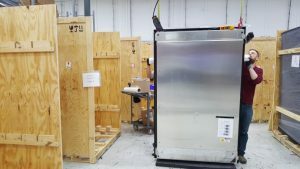 The facility has giant laser and water jet cutting machines, a series of Italian machines that do semi-automated precision metal bending, and a crazy vacuum sealer bag thingie that pulls sealed layers together without putting weight on them. 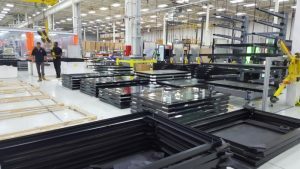 The optical glass that is used to front displays was previously outsourced, but a whole assembly line is now being built that will bring all that in-house within a month – going from raw mother glass sheets through cutting, polishing, painting and curing. The company even has a wood shop making its own custom shipping crates for the giant displays. But before they get packed, every unit goes through a quality control process that includes time in a shower to verify its water tightness. Funnily, on a floor packed with robotics and precision tools, the best way to dry off a wet display was a guy, a ladder and a leaf blower. In the digital signage business, sticker price is the irrational driver behind everything from hardware and software to installation deals. There’s always a healthy chunk of end-user/buyers who don’t really know what they’re looking at and buying. So they revert to comparing base specs or appealing visuals in making decisions. Sales guys with “premium” products make the Total Cost of Ownership argument, but a percentage of the buying market thinks they can get what looks to be pretty much the same thing – whatever that thing is – for less. I’ve had may conversations with the heads of software companies who say a big part of trade for them is replacing the first system that went in, and went badly. 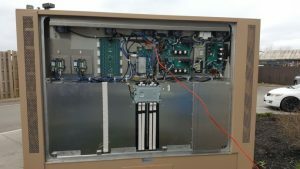 Dunn says the same thing happens, as they get calls from media companies that opted for lower initial costs and learned the hard way that the cost ended being far higher – between installation complications, rolling trucks and techs for servicing and repairs, and the screens dimming out by the third year. Smart and/or seasoned buyers do things like shootouts. Dunn was up in the Toronto area last week watching a drive-thru install at an outlet of a major QSR chain – pitting his pre-sell and menu displays against three other vendors. I was able to get down to Atlanta because I hitchhiked back with him on his company’s six-seater plane, which Dunn personally flies. I’ve also had conversations with digital hardware companies who say their best sales tool is a site visit. I visited a custom PC maker last fall, and their folks said if they got prospects to come out for a tour, the close rate on deals was just about 100%. Inside back panel of 84″ drive through menu display. Dunn confirmed that the same thing happens when his sales team get prospects to brave Atlanta traffic and make their way up to the plant. I can remember, years ago in my dark and mercifully brief sales past, staring dumbstruck at a software developer who told me a critical feature was ready, faster than expected, for a monster client that I was trying to close. “You’ve tested it?” I asked. “It should work,” he replied. He didn’t even know he was having a near-death experience. In this case, if you are a media company putting a 75-inch display on the end of a sidewalk transit shelter, that cost $20K-plus, it’s just got to work. And work well, And look great. For years. And with 70% of sales at many QSRs being based on drive-thru lanes, a screen that gets dim or dark is a screen that’s losing sales. The thrive and not just survive thing Dunn mentioned as we walked into his plant definitely makes sense. The LG in LG MRI, by the way, is THAT LG. The two companies have a joint venture, and LG’s display technology is central to the product line. The electronics giant has some staff on site in Georgia, but the company is owned and run by Dunn. There are also some products that are marketed as MRI, that are not part of the LG partnership. This article has been reposted with permission from the Sixteen:Nine blog.